This says my activity calories were 25% of total calories burned. 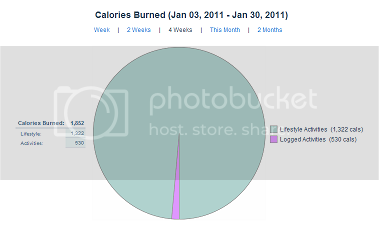 But the pie chart shows just a tiny sliver of activity calories - nowhere near the 1/4 pf the pie it should. Am I misreading something? Hmmm, I never noticed that before. What do you log besides exercise? I just looked at mine... I'll have to ask! Most of the past couple of weeks, I've been logging 1-2.5 hrs of shoveling snow every day. Also, sometimes shopping with/without shopping cart. And, this past week, had two long drives of 4 hours each. Is it possible that, for non-regimented activities like those mentioned, as opposed to swimming or walking, the system isn't giving me credit? I was thinking that lifestyle activities are showing up as activities logged but do not count as extra exercise. If I log 6 hours of sleep it does not count as extra cals burned. It actually brings my total cals burned down by 110 cals a day. I'm thinking the pie chart only shows what we burn above our BMR. I already sent this question off so I will post as soon as I hear back! I actually go by my daily pie chart. It looks soooo much better!